Running a day late after a delay caused by unfavorable high-altitude winds over the spaceport in French Guiana, the Soyuz ST-A rocket fired its liquid-fueled engines, throttled up to full power, and climbed into a partly cloudy sky at 1637:14 GMT (11:37:14 a.m. EST) Wednesday with France’s CSO 1 military observation satellite. Liftoff occurred at 1:37 p.m. French Guiana time, and the Soyuz soared north from the European-run spaceport on the northeastern coast of South America, heading for a polar orbit atop 900,000 pounds of thrust from its core stage and boosters. The four strap-on boosters shut down and jettisoned around two minutes into the mission, and the core stage engine consumed its kerosene fuel supply just shy of the flight’s five-minute mark. The Soyuz also released the clamshell-like, two-piece shroud covering the CSO 1 spacecraft as the rocket reached space. A third stage RD-0110 engine ignited next, followed by a pair of engine firings from the Soyuz rocket’s Fregat upper stage to maneuver the 7,859-pound (3,565-kilogram) CSO 1 reconnaissance satellite into a circular orbit. The French military payload, primarily built by Airbus Defense and Space, separated from the Fregat stage over a ground station in Australia about one hour after liftoff at an altitude of 499 miles (803 kilometers). 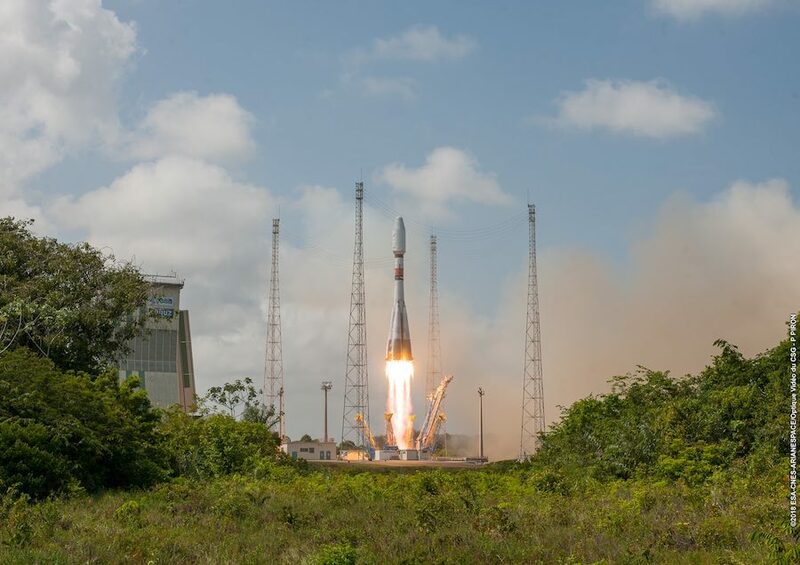 Officials soon declared success on the launch, ending a year of 11 missions by Arianespace, the French launch provider that operates Ariane 5, Soyuz and Vega rockets in French Guiana. “Arianespace is delighted to confirm that the CSO 1 satellite has been successfully separated in its targeted sun-synchronous orbit,” said Stephane Israel, Arianespace’s CEO. Wednesday’s flight concluded a period of five launches in two months for Arianespace, with two launches by the heavy-lift Ariane 5 rocket, two Soyuz flights, and one launch by the light-class Vega booster. 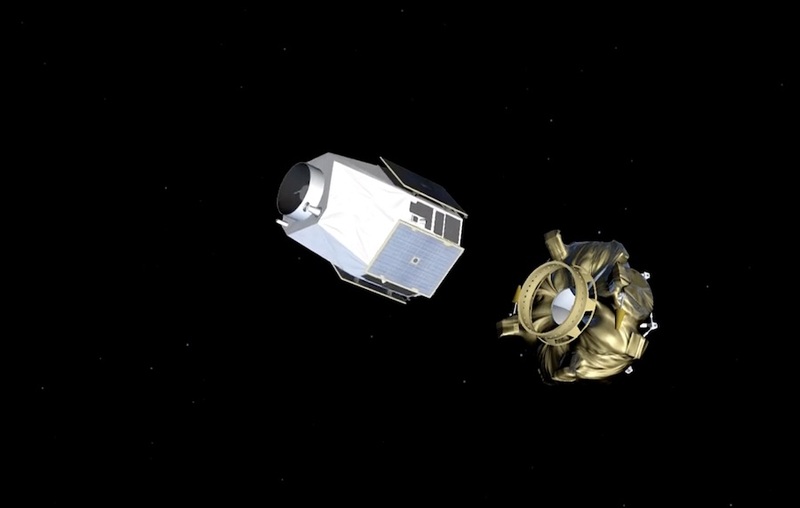 CSO 1 is the first spacecraft in the French military’s new Composante Spatiale Optique, or CSO, series of reconnaissance satellites. The French government has procured three CSO satellites, beginning with the craft launched Wednesday, to form the military’s new space-based optical surveillance network. The CSO satellites will replace the Helios family of reconnaissance satellites, the last of which launched aboard an Ariane 5 rocket in 2009. “Just a few moments ago, our space technology, our capability and our intelligence services have made a great leap forward,” Parly said. “Just a few moments ago, the fight against terrorism, the success of our operations and our strategic autonomy have also made a great stride forward. The space-based optical component is a challenge that we have successfully risen to. France has placed the most high-power observation system in the world in orbit. Designed for a 10-year mission, the CSO 1 satellite will be joined in 2020 or 2021 another CSO spacecraft launched on a Soyuz rocket flight into a lower orbit around 300 miles (480 kilometers) in altitude, enabling it to collect even sharper imagery for analysis by European military officials. A third CSO satellite, made possible with German financial support, will be launched by Europe’s next-generation Ariane 6 rocket in the 2022 timeframe. The CSO satellites reportedly have a resolution of around 14 inches, or 35 centimeters, from the 500-mile-high orbit. From the lower 300-mile-high perch, CSO 2’s resolution is predicted to be better than 8 inches, or around 20 centimeters. For comparison, the newest commercial Earth-imaging satellites operated by DigitalGlobe have a resolution of about a foot, or 31 centimeters. The imaging capabilities of the U.S. government’s spy satellites are classified. The new-generation CSO spy satellite fleet cost more than $1.5 billion, including spacecraft, launch and ground system upgrade expenses, according to French authorities. The program is funded through the DGA, the French military’s procurement agency, and the French space agency CNES is responsible for in-orbit testing, satellite operations, and the purchasing of the spacecraft and launch services. The French government has agreements with the governments of Germany, Sweden and Belgium to share CSO imagery, and an agreement with Italy is expected to be signed soon, officials said. In exchange, the French military receives imagery from German and Italian radar observation satellites, which are designed for day-or-night, all-weather surveillance. The CSO satellites will also provide intelligence agencies and military officials imagery day-or-night in visible and infrared bands. Each spacecraft features an agile pointing capability, allowing rapid steering from target to target, and enabling views from different look angles for three-dimensional stereo surveillance products. “CSO offers numerous improvements,” said Gilles Chalon, CSO project manager at CNES. “First, better precision with imagery of unrivaled quality in Europe, thanks mainly to its large telescope. Second, more capacity with more images acquired per orbit and per day, and above all, greater agility. “This extra agility means more images can be acquired when flying over a particular area of interest. And third, improved responsiveness, with the ability to downlink images from the satellite to a ground station near the polar circle in Sweden. This significantly shortens the time from request to delivery,” Chalon said. In remarks after Wednesday’s launch, the French defense minister said a military budget signed into law by French President Emmanuel Macron earlier this year will allow for a “full renewal” of France’s space-based military capabilities. Besides the CSO satellites, which were already budgeted, the new procurement act will continue development of a trio of intelligence-gathering satellites for launch aboard a Vega rocket in 2020. The formation-flying CERES satellites will detect radar, radio and other electromagnetic signals to help located the military command centers, naval fleets and other infrastructure used by France’s adversaries. The CERES constellation will be France’s first operational signals intelligence satellite system, following two launches with experimental satellites to test precursor technologies in 2004 and 2011. France is also developing two new dedicated military communications satellites — Syracuse 4A and 4B — for launch on Ariane 5 rockets by 2022. The French government has approved the construction of a third new military comsat for launch after Syracuse 4A and 4B, Parly said. Parly said ensuring Europe has a home-grown launcher family will also help keep France from relying on other nations for military space capabilities, especially countries outside of Europe. The European Space Agency and Ariane Group, parent company of Arianespace, are developing the new Ariane 6 rocket through a cost-sharing public-private partnership. The Ariane 6 is advertised as a less expensive replacement for the Ariane 5 rocket. “France and Europe need free and autonomous access to space,” Parly said through a translator. “This is no quirk. This is an absolute requirement.